*Australian Memories Discover Aussie Land and the Mysterious Red Center by Ndeye Labadens. Price: Free. Genre: Business of Art, Teen & Young Adult, General, Arts & Photography, Travel, Australia & South Pacific. Rated: 4.7 stars on 35 Reviews. 83 pages. ASIN: B01M27AV3T. The Philly Baby Bump Guide: Pregnancy, Postpartum, and Parenting in Philadelphia by Victoria Hefty. Price: Free. Genre: Pregnancy & Childbirth, Mid Atlantic, Philadelphia, Health, Fitness & Dieting, Travel. Rated: 4.7 stars on 6 Reviews. 82 pages. ASIN: B01FSZHWF2. London in 3 Days: The Definitive Tourist Guide Book That Helps You Travel Smart and Save Time (England Travel Guide) by Finest City Guides. Price: Free. Genre: London, General, Budget Travel, Travel. Rated: 4.2 stars on 5 Reviews. 33 pages. ASIN: B012BT3FCM. Posted on November 30, 2016 Author KibetCategories Budget, Free Travel Kindle Books, TravelersLeave a comment on Kindle Travel Deals for Tuesday! 5 Great Free Kindle Travel Books for Monday! *100 Tips for Traveling with Kids in Europe by E. Ashley Steel, Bill Richards. Price: Free. Genre: Europe, General. Rated: 5 stars on 4 Reviews. 128 pages. ASIN: B01M18SHTU. *SPANISH: SPEAK SPANISH TODAY: THE COMPLETE BEGINNERS GUIDE TO LEARNING SPANISH FAST AND EASILY WITH FLASHCARDS, AUDIO AND MUCH MORE! (Spanish for dummies, Rosetta Stone) by Speak.It.Today. Price: Free. Genre: Travel, South America, Children’s Books, General, Spanish, Phrasebooks. Rated: 4.6 stars on 37 Reviews. 500 pages. ASIN: B01HOWUI8K. Taiwan: Taiwan Travel Guide: 101 Coolest Things to Do in Taiwan (Taipei Travel Guide, Tainan, Taichung, Taiwanese Food, Backpacking Taiwan, Asia Travel Guide) by 101 Coolest Things, Taiwan .. Price: Free. Genre: Southeast, General, Taiwan, Travel, Central. Rated: 4.8 stars on 5 Reviews. 46 pages. ASIN: B01N77H9WN. Pereira City Guide: La Ciudad Sin Puertas (Open Minded Travel Guides Book 1) by Erin Donaldson, Andrew Donaldson, Mary Donaldson. Price: Free. Genre: Spanish, Ecotourism Travel, Teen & Young Adult, Ecotourism. Rated: 4.8 stars on 5 Reviews. ASIN: B01HIO4JXE. Have Bags, Will Travel: Trips and Tales ? Memoirs of an Over-Packer by D.G. Kaye, Talia Leduc. Price: Free. Genre: Essays, Humor & Entertainment, Memoirs, Travelers & Explorers, Biographies & Memoirs. Rated: 4.5 stars on 9 Reviews. 56 pages. ASIN: B015HP1R6S. Posted on November 28, 2016 Author KibetCategories Biographies, Free Travel Kindle Books, memoir, TravelersLeave a comment on 5 Great Free Kindle Travel Books for Monday! *Bare Naked Nomad: The Ultimate Guide to Traveling the World (Even if all you have is a backpack and a dream.) by Liz Wright. Price: Free. Genre: Business Travel, Budget Travel, Teen & Young Adult. Rated: 5 stars on 8 Reviews. 164 pages. ASIN: B01LZMJ8E0. *Luxurious Chiang Mai: The complete guide to having a 5 star holiday or honeymoon in Chiang Mai by Laura Gibbs. Price: Free. Genre: Travel, Spas, Southeast, Honeymoons. Rated: 5 stars on 6 Reviews. 237 pages. ASIN: B01MD1HABX. *Bangkok – A Photographic Commentary by Alan Reeder-Camponi. Price: Free. Genre: Southeast, Bangkok, Senior Travel, Travel, Thailand. Rated: 5 stars on 4 Reviews. 83 pages. ASIN: B01DF6QTIC. Posted on November 27, 2016 Author KibetCategories Budget, business, Free Travel Kindle Books, TravelersLeave a comment on Kindle Travel Deals for Saturday! *(Free For Kindle Unlimited) Quit Your Job & Travel The World: The Complete Guide To Making Your Dream A Reality (Deal, Not Free) by Anjali Sareen. Price: $3.99. Genre: Nonfiction Book Deal, Sponsor, Travel the World, How to Be Free. Rated: 5 stars on 2 Reviews. 126 pages. ASIN: B01MQ6IQ5E. *Southern Fried Running: Stories About Road Races in the Southeastern United States (Fifty State Race Stories Book 1) by Tom Leddy. Price: Free. Genre: Travel, Running & Jogging, East South Central. Rated: 5 stars on 4 Reviews. 166 pages. ASIN: B00ZS53PE0. Posted on November 25, 2016 Author KibetCategories Free Travel Kindle BooksLeave a comment on Kindle Travel Deals for Friday! How to Sail a Boat: Sailing & Yachting 101 Basics for Beginners by Samuel Brazil. Price: Free. Genre: Sailing, Travel, Adventure, Sports & Outdoors. Rated: 4.2 stars on 5 Reviews. 25 pages. ASIN: B01ASZ5N44. Posted on November 24, 2016 Author KibetCategories Free Travel Kindle BooksLeave a comment on Kindle Travel Deals for Thursday! Posted on November 23, 2016 Author KibetCategories Free Travel Kindle Books, TravelersLeave a comment on Kindle Travel Deals for Wednesday! 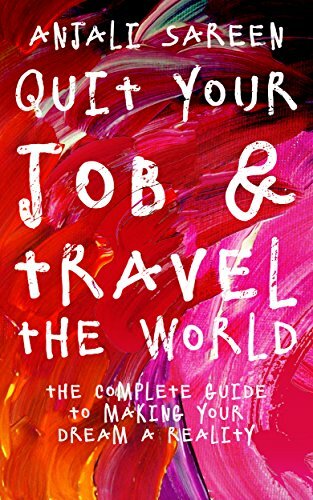 *(Free For Kindle Unlimited) Quit Your Job & Travel The World: The Complete Guide To Making Your Dream A Reality (Deal, Not Free) by Anjali Sareen. Price: $3.99. Genre: Travel Book Deal, Sponsor, Travel the World, Be Free, Nonfiction. Rated: 5 stars on 2 Reviews. 126 pages. ASIN: B01MQ6IQ5E. *Speak Spanish: Powerful Intermediate Guide To Learn Spanish (Spanish,Spanish Language, Spanish Stories) by Language Mastery. Price: Free. Genre: Travel, Phrasebooks, Foreign Language Dictionaries & Thesauruses, Spanish. Rated: 4.5 stars on 10 Reviews. 129 pages. ASIN: B01N3Z2JUL. Ireland: A Backpackers Travel Guide by S Daly. Price: Free. Genre: Ireland, Budget Travel, General, Travel. Rated: 4.7 stars on 6 Reviews. 47 pages. ASIN: B01K2IB2AG. Posted on November 23, 2016 Author KibetCategories Budget, Free Travel Kindle BooksLeave a comment on Kindle Travel Deals for Tuesday! 7 Great Free Kindle Travel Books for Monday! ***My Story as an American Au Pair in the Loire Valley (French Illusions Book 1) (Deal, Not Free) by Linda Kovic-Skow. Price: $0.99. Genre: Memoirs Book Deal, Sponsor, Travel, Adventure, Nonfiction, Loire, France, Adventure. Rated: 4.2 stars on 257 Reviews. 275 pages. ASIN: B00BG0EV8A. *Chinese Phrase Book: Learn Chinese Quick and Easy With Chinese Phrases (Chinese Phrasebook, Learn Chinese, Learn Mandarin, Chinese Phrases, Mandarin Phrases, China Travel Guide) by Zhang Jing. Price: Free. Genre: China, General. Rated: 5 stars on 4 Reviews. 98 pages. ASIN: B01KP4HEJU. *A Mile and a Half by Frank Scozzari. Price: Free. Genre: Travel, Literature & Fiction, Men’s Adventure, Short Stories, Excursion Guides, Specialty Travel. Rated: 4.9 stars on 22 Reviews. 10 pages. ASIN: B014XQYC3C. *John Barleycorn by Jack London. Price: Free. Genre: Biographies & Memoirs, Adventurers & Explorers, Travel, Travelers & Explorers. Rated: 4.3 stars on 62 Reviews. ASIN: B01N77EST8. Pisikoa: South Pacific Diary ’78-’80-Enduring Uncle Mikey by Michael Baughan, Paul Karrer. Price: Free. Genre: Parenting & Relationships, Travel, General, Parenting, Australia & South Pacific. Rated: 4.7 stars on 7 Reviews. 222 pages. ASIN: B01EZ2ZF8A. Slow Boat to Cuba by Linus Wilson. Price: Free. Genre: Sailing, General, Sports & Outdoors, Travel, Narratives, Caribbean. Rated: 4.2 stars on 17 Reviews. 99 pages. ASIN: B01MFFX9AG. Posted on November 21, 2016 Author KibetCategories Free Travel Kindle Books, memoir, TravelersLeave a comment on 7 Great Free Kindle Travel Books for Monday! 5 Wonderful Free Kindle Travel Books for Sunday! *(Free For Kindle Unlimited) Quit Your Job & Travel The World: The Complete Guide To Making Your Dream A Reality (Deal, Not Free) by Anjali Sareen. Price: $3.99. Genre: Travel Book Deal, Sponsor, Travel the World, Be Free, Adventure. Rated: 5 stars on 2 Reviews. 126 pages. ASIN: B01MQ6IQ5E. *Relocation Without Dislocation: Make New Friends And keep the Old by Ndeye Labadens. Price: Free. Genre: Volunteer Work, Politics & Social Sciences, Business Travel, Travel. Rated: 4.8 stars on 29 Reviews. 85 pages. ASIN: B01I41TOHG. *China: Where To Go, What To See – A China Travel Guide (China,Shanghai,Beijing,Xian,Peking,Guilin,Hong Kong Book 1) by Worldwide Travellers. Price: Free. Genre: China, Beijing, General, Shanghai, Hong Kong. Rated: 4.7 stars on 26 Reviews. ASIN: B01MTM4VKQ. Peru: Peru Travel Guide: 101 Coolest Things to Do in Peru (Machu Picchu, Inca Trail, Backpacking Peru, Budget Travel Peru, Lima Travel Guide) by 101 Coolest Things, Peru. Price: Free. Genre: Peru, Budget Travel, Travel. Rated: 5 stars on 4 Reviews. 35 pages. ASIN: B01N0BAMEN. Posted on November 20, 2016 Author KibetCategories Budget, business, Free Travel Kindle Books, memoir, TravelersLeave a comment on 5 Wonderful Free Kindle Travel Books for Sunday! *The Uncensored Account of the Perilous 1979 Expedition to Save Armenian Monuments in Cilicia, Turkey by Robert W. Edwards. Price: Free. Genre: Biographies & Memoirs, Landmarks & Monuments, Travelers & Explorers, Travel, Adventurers & Explorers. Rated: 5 stars on 5 Reviews. 422 pages. ASIN: B01K8QM7HY. Posted on November 19, 2016 Author KibetCategories Biographies, Free Travel Kindle Books, memoir, TravelersLeave a comment on Kindle Travel Deals for Saturday!